Mount Si has a bit of a bad reputation in some circles of the Seattle outdoors community, mostly for its crowded trails, so I wasn’t sure exactly what to expect when I stood in the trailhead parking lot in May 2008. It was pretty early – maybe 5:30 am – so the notorious crowds were not present and, from what I read, the hike seemed like it would be an interesting one in dense forest with good views once at the summit basin. One thing I knew for sure was that hike was of the steep variety, rising more than 3,000 vertical feet in no more than 4 miles. And this steep nature of the trail -along with the mountain’s proximity to Seattle – was why I was there in the first place. I was there, first and foremost, to train for an upcoming Mount Rainier climb. The main trail is about 4 miles (8 miles roundtrip). The total elevation gain to the summit basin is about 3,200 feet. The true summit is atop the Haystack, which involves a 300-foot scramble to reach. Si is climbed year-round and snow gear may be necessary depending on the time of year. 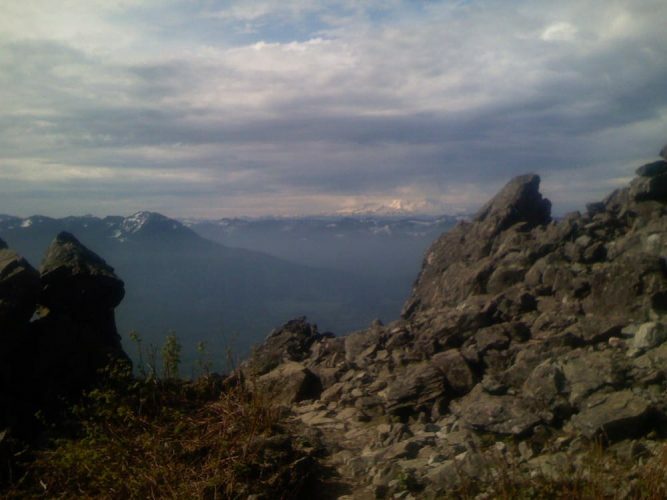 Estimates of the total yearly visitors to Mount Si top out at 100,000. Mount Si is named after a local early settler by the name of Josiah “Uncle Si” Merritt. I was on the trail at Mount Si primarily for Mt. Rainier training purposes and Mount Si did not let me down in that respect. From the trailhead, which begins at an altitude of about 700 feet, the first mile got my heart pumping quickly, rising about 900 vertical feet. Around the two-mile mark a relatively flat section of the well-maintained trail surfaced and served as welcomed resting spot before the second half of the hike. This second half includes about 2 miles of hiking and about 1,800 feet of elevation gain. The final mile of the trail was a relentless climb up through conifer trees until the rocky edges of the summit basin began to surface. The hike is almost entirely within dense Pacific Northwest forest but offers up tremendous views of the Snoqualmie Valley, Puget Sound and the Olympic Mountain Range once the summit basin is reached. Overall, my experiences on Mount Si were good ones. The trail is physically demanding, especially with a heavy pack on, but is well-maintained and presents excellent views of the greater Seattle region as a added bonus. This trail is definitely a great option to train on for those living in or near Seattle. Just be sure to hit the Mount Si trail early to beat the crowds. From Seattle, I-90 east to 436th Avenue SE (exit 32). Turn left (north) over the freeway and drive 0.5 mile to North Bend Way. Turn left, travel for about another 0.25 mile and then turn right (north) onto Mount Si Road. The Mount Si trailhead parking lot is on the left, in about 2 or 2.5 miles. Elevation change (estimate): 3200 ft.